Is the Round the phone you'll want to keep around? 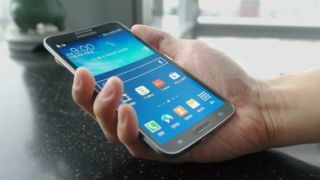 The Samsung Galaxy Round is the world's first phone with a curved display, beating LG's rumored handset out of the gate. But is this eye-catching device any better than the Samsung Galaxy Note 3 or the multi-million selling Samsung Galaxy S4? Will the new design and the functionality that goes along with it improve the way we use a smartphone? The Galaxy Round is essentially a customized version of the existing Samsung Galaxy Note 3. But where the Note 3 has a flat 5.7-inch display, the Round features a concave 5.7-inch 1080p panel - the first of its kind in a commercial handset. The back of the Round is also delicately curved, enabling various 'tilt'-activated functions when placed onto a table. You can tilt the phone to quick-peek at key lock screen info (i.e. date, time, missed calls), tilt to skip tracks or to browse through photos. The eye-catching curved design makes a difference to the size and weight. The dimensions are almost the same - 151.1 x 79.6 x 7.9mm for the Round, 151.2 x 79.2 x 8.3mm for the Galaxy Note 3. The Round, however, is noticeably lighter, tipping the scales at 154g compared to the 168g bulk of its forbear. It's just a guess at this point, but the curved design of the Round should make it more comfortable to hold than the Note 3. Like the Galaxy Note 3, you'll struggle to fit the Round into a pocket - it's more tablet than traditional phone. The flagship Samsung Galaxy S4 is still the smaller, lighter handset, measuring 136.6 x 69.8 x 7.9mm and weighing 130g. Note how the Round matches the tiny waistline of the S4. Finally, the Galaxy Round is initially available in what Samsung has dubbed 'luxury brown', while the Note 3 comes in black, white and pink hues. As previously mentioned, the Samsung Galaxy Round catches the eye with a curved 5.7-inch Super AMOLED display with a 1080p (1920 x 1080 pixel) resolution. It has the same technology, resolution and pixel density (386 PPI) as the Galaxy Note 3 and comes with the same S-Pen stylus for point-perfect touch control. Like the Note 3, the Round is also capable of running applications in multiple windows. How do the two devices compare to the Samsung Galaxy S4? The S4's 5-inch screen is 0.7 inches smaller, but uses a similar 1080 x 1920 Super AMOLED panel that has a sky-high PPI rating of 440.6. The S4 also supports Samsung's Multi Window functionality. Away from the curved display the Galaxy Round, Note 3 and Galaxy S4 match each other for imaging technology. All three feature a 13MP lens on the back and a 2MP front cam. Features include autofocus, an LED flash, face and smile detection, HDR, image stabilisation, panorama mode and 1080p video recording, plus clever Dual Shot and simultaneous video/image capture modes. With the Samsung Galaxy Round debuting in Korea, it comes with LTE-A (LTE Advanced) connectivity where the Galaxy Note 3 and Galaxy S4 are equipped with LTE chipsets. It's the only core difference between the phones, which all boast 802.11a/b/g/n/ac, Bluetooth 4.0 and NFC options. Again, there are no surprises here - bar its curved display, the Galaxy Round is a variation on the Note 3, not a revamp. Consequently, the Samsung Galaxy Round comes packing the same 2.3GHz quad-core Snapdragon 800 chip as its flatter brother, ably assisted by the Adreno 330 co-processor and 3MB of RAM - 1MB more than the S4. The Galaxy Note 3 can support the Exynos 5 Octa 5410 silicon that was pegged for the Samsung Galaxy S4, so we'd expect the Galaxy Round to be just as flexible if it catches on with consumers. In terms of software, expect to find Android 4.3 on all three phones. Where the Galaxy Note 3 and the Galaxy S4 are available in 16, 32 or 64GB capacities, the Samsung Galaxy Round comes in a take-it-or-leave-it 32GB option. That said, it features the same microSD slot as the other two Samsung devices, enabling the storage to be boosted to as much as 96GB with the addition of a 64GB memory card. As far as battery life is concerned, the Galaxy Round seems to feature a smaller 2800mAh battery, compared to the 3200 mAh cell in the Galaxy Note 3. This is obviously a disadvantage of the new curvy design. That said, the Galaxy Note 3 didn't gobble up battery life as expected, especially considering its 5.7-inch display. The Galaxy S4 hides a 2600mAh Li-Ion pack. So performance should be similar - Samsung rates the Note 3 with a standby time of 420 hours and a talktime of 21 hours. Use the Round for email, web browsing, music playback and all the other things that a smartphone is capable of doing, and you'll easily get a day's use on a single charge. Far from being a new super-phone, the Samsung Galaxy Round is essentially a curved-screen version of the Galaxy Note 3. Bar LTA-A and 14g of weight loss, the two tablet-phones are almost identical, differentiated by the Round's flexible screen and the tilt functionality that it enables. The screen itself isn't any better (or worse) than existing displays and it's hard to see the populist value in the new design. If Samsung had debuted a truly flexible display, we'd be clamoring to own one. As is, the Galaxy Round is hardly going to change the game. Why not check out our Galaxy Note 3 review? It's flat but built for power users.